One million ways with mac and cheese– Mac and cheese might be the most popular classic of all the comfort foods. It is also one of the most versatile. Ask your personal chef to come up with some variations that would fit with your menu and size of your guest list. For an intimate dinner party, you might want to consider serving a family-style mac and cheese with some out of the ordinary cheese variations and a crisp, oven browned topping. For a larger dinner party, serving mini mac and cheese bites as appetizers or individual mac and cheese ramekins as a first course would be a great way to include this classic and well-loved dish. Talk with your personal chef about mixing up herbs, spices, cheeses, and pasta shapes for endless variations on this classic dish. Gratins-Gratins are super versatile and can be dressed up very easily while still maintaining that comfort food feel. These gorgeous combinations of vegetables, herbs, and cheeses, are baked to golden perfection and compliment any comfort food menu. Try an of -the- moment cauliflower gratin, or a mixed root vegetable gratin for late Fall or Winter. Switch it up for warmer months with a gratin of Spring greens like asparagus, fennel, and green onions. Have vegetarian guests? A gratin makes a great main course for non-meat-eaters. Gratins also make great deserts when savory ingredients are swapped out for sweet. Grilled Cheese Bites– Grilled cheese is another super-popular comfort food. Try switching up its classic presentation by serving this sandwich miniature style as part of a small bite menu, or as an appetizer. Add in different ingredients, like roasted butternut squash, caramelized onions, or spinach, or serve with a shot glass of tomato soup for a nostalgic take. One Pot Comfort dishes-The one-pot dinner has long been a comfort food staple. Dress it up by serving braised lamb shanks with polenta, sausage and lentil cassoulet, or perfectly seasoned roast chicken with crispy potatoes. Italian Dishes-Classic Italian staples, like lasagna and spaghetti and meatballs are loved by all. One of the most interesting things about serving a comfort food menu to your dinner party guests is the element of surprise. Guests may come to a dinner party expecting something extravagant and be very pleasantly surprised by a home-style comfort food meal. 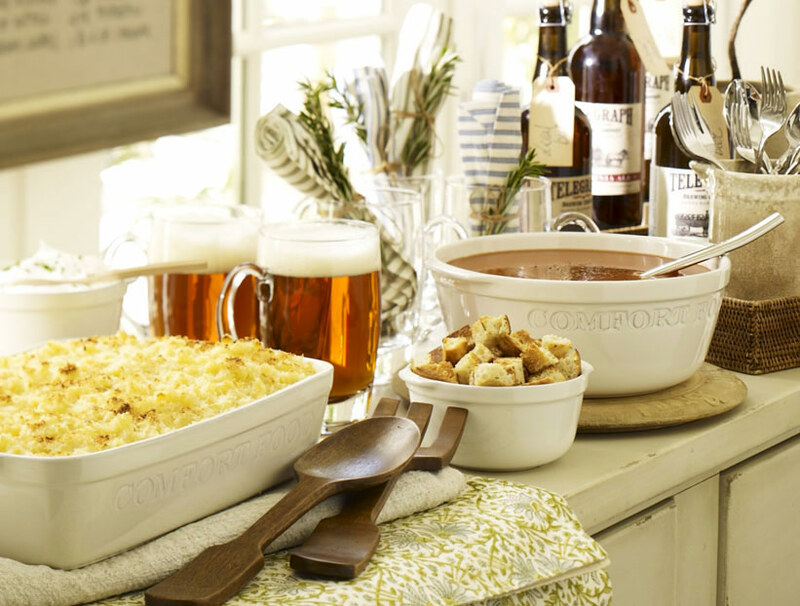 Talk with your dinner party chef about serving a comfort food menu at your next gathering. Comfort foods are a great way to serve delicious food and give guests a little something different than what they might expect.